With the holidays coming up, I’ve been looking for ways to cut back on spending, especially since the holidays this year involve several out of state trips for me. The simplest solution now that my con season is over is to cut back on costume purchases. After looking through my fabric stash a few weeks ago, I decided that was a really good idea. My fabric stash is overflowing with things I bought on a whim for costumes, several of which are probably not going to happen. So I’ve given myself a challenge: I will not buy fabric or costume supplies through the end of this year (I know, I know, two months isn’t *really* a challenge, but it’s a start). At the first of the year, I’ll probably dump some of my uglier fabrics as well (I’m looking at you, car upholstery. Bleh). 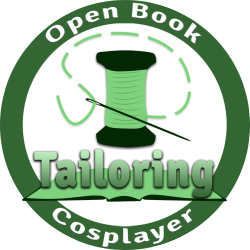 During the holidays, I’m going to focus on getting a start on some costumes that I can finish with my current stash and do a bit of non-costume sewing. Ms. Marvel: Started cutting fabric. Still need materials for the red sash. Whew! That’s a lot. Fortunately, I have the entire week after Christmas off work, so I’ve got a dedicated sew-cation planned. I had hoped to start working on some work-friendly attire, but I’ll have to hold off until January when I let myself buy fabric again. Anyone else got holiday/vacation sewing lined up?